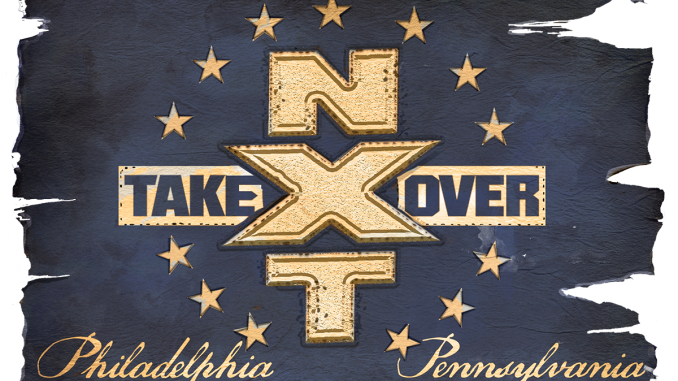 Welcome to POST Wrestling’s coverage of NXT Takeover from the Wells Fargo Center in Philadelphia, Pennsylvania. The panel consists of Charly Caruso, Sam Roberts, and Samoa Joe. Joe said his current injury will not allow him to participate in any of the events this weekend. Throughout the show, Renee Young and Corey Graves will be handing out the NXT year-end awards. Joe did a fantastic breakdown for Aleister Black and Adam Cole. Joe is already fantastic in this role in less than ten minutes. The first award is for “Rivalry of the Year” and the winner is Aleister Black vs. Velveteen Dream. Dream accepts the award, he thanked God because “the dream is the closest thing to the light” and guarantees a 0:30 or less knockout over Kassius Ohno tonight. The nominees for “Female Competitor of the Year”: Asuka, Ember Moon, Nikki Cross, Ruby Riott, and Billie Kay & Peyton Royce (as a duo) and the winner is Asuka. Asuka made a quick appearance and said she will win the Royal Rumble. The “Match of the Year” is Tyler Bate vs. Pete Dunne (Takeover: Chicago). Tyler Bate accepted the award and had very little to say. Pete Dunne joined the panel, Charly stated that Dunne “became a household name in 2017” and Joe stated Bate and Dunne went out and became ambassadors for British wrestling. Dunne said he wants to be NXT champion and mentioned he’d love to face Brock Lesnar. The final award “Overall Competitor of the Year” and awarded to Asuka. The pre-show ended with Zelina Vega joining the panel and complained about Andrade Cien Almas not winning any awards. She demanded a recount for the awards. This was a very good panel segment with Vega arguing with Joe and Roberts. The main show begins with a video featuring Paul Heyman to describe the history of Philadelphia. “This isn’t about dwelling on the past, it’s about embracing the future.” This was a great opening, tremendous use of Heyman and started the show off well. Mauro Ranallo and Percy Watson are calling the show and explain that Nigel McGuinness is under the weather. The Authors jumped them before the bell rang. Rezar takes O’Reilly down and is trying to land hammer fists in O’Reilly’s guard and O’Reilly attempts a triangle from his back. Fish entered and tackled Rezar through the ropes to the floor. Fish and O’Reilly attacked the left leg of Akam. He tries to fight back with one leg. Fish repeatedly lands leg kicks to the knee after hitting a dragon screw leg whip through the ropes. Fish and O’Reilly are both attacking the knee and utilizing kneebars and I’m having flashbacks to Suzuki vs. Tanahashi from earlier today. Akam makes the tag to Rezar, he fires up on both and tosses both with a Samoan drop / fallaway slam combination. O’Reilly kicks the knee of Rezar to allow Fish to deliver an exploder. O’Reilly applies a kneebar to Akam and Fish has a rear-naked choke on Rezar, Rezar flips Fish on top of O’Reilly to free both men. O’Reilly continues with leg kicks to Akam, he knocks Fish off the apron and lifts O’Reilly and hits a buckle bomb. Rezar is in and they hit the Super Collider, O’Reilly hits a head scissors and sends Akam into Rezar and rolls up Akam with a school boy. This was a strong opener, great work from Fish and O’Reilly using a kickboxing style of breaking down the leg of Akam with leg kicks and working that body part all match long. War Machine is shown to the audience and identified using that name. Dream comes out and there is a woman with a custom mouthpiece for him and the former Blaster McMassive from CHIKARA holding a pillow with the mouthpiece on top of it. Dream has boxing shorts with Ohno and his faces airbrushed on them. The crowd started counting to 30 based on Dream’s promo. He landed a big shot and the place exploded but Ohno got up and nailed him with an elbow and the audience was so disappointed Dream didn’t get the stoppage win. Ohno landed a spin kick to the face, he called for the rolling elbow, Dream cut him off with a superkick and hit a rotating spiked DDT for a two-count. Ohno dove at Dream and was supposed to be caught into a Death Valley Driver but it was mistimed. Ohno lands the rolling elbow and Dream kicks out. Dream comes back and lands the Death Valley Driver, climbs to the top and dives off the post with the Purple Rainmaker for the win. Dream was very popular with this audience. This wasn’t at the level of the Aleister Black in November as they had a few hiccups throughout the match. Ohno is outstanding but the audience knows what his role is and it’s hard to get behind him in a match like this against the pushed character in Dream. Maria Menounos was shown in the crowd and will be the ring announcer for the women’s Royal Rumble. There is a shot of Johnny Gargano in his locker room with his family. Moon is referred to as the “She-nom”. After avoiding a choke, Moon attacks with a series of dropkicks to the head sends Baszler to the floor and lands a tope suicida. Baszler stomped down on the elbow of Moon just as she did to Dakota Kai on television. Moon fought back with one arm, including a dive off the middle rope with a clothesline using her good arm. Moon hit a one-armed Eclipse but in doing so, re-injured her arm when she landed and couldn’t cover the motionless Baszler. The physicians run down to check on Moon. Moon stays in the match and goes over to Baszler and walks into an armbar. Moon has her feet on the bottom rope for the break. Baszler brings her to the center and goes for the armbar again as Moon is scratching at Baszler’s arm, trying to keep her hands clasped and Baszler continues applying pressure. Moon is struggling and adjusting and finally bridges Baszler for the pin out of nowhere. It was a well put together match for someone with as limited experience as Baszler has. The heel work by Baszler was very good and plays a great bully with the submission offense. The way this ended made you feel this feud will continue as it was presented as a fluke and could lead to a submission match where Moon defends the title in Baszler’s specialty. Trevor “Ricochet” Mann was shown in the audience. Both received massive reactions for their entrances and are the both over performers on the show so far. They were chanting “this is awesome” before they even locked up. Cole quickly gets a chair at ringside and the audience chants “ECW”. Black is seated in the ring, Cole swings and misses as Black takes control of the chair, Cole bails to the floor and Black sits down on the chair inside the ring. Chairs and garbage cans were brought into the ring very early in the match. Cole grabs a kendo stick and Black gets one of his own. Black tosses his stick aside and challenges Cole. Black strikes with an elbow and attempts a quebrada and Black is nailed in the ribs with the kendo stick in mid-air. Cole set up a table on the floor, Black stopped a superplex attempt and tossed Cole from the top onto a garbage can in the ring. Cole is bleeding and the referee checks on him so Black goes to the floor and sets up the second table. Black brings out a ladder and Cole hits a baseball dropkick to send the ladder into Black. It looks like Cole has cut open his right hand. Black lifts Cole on his shoulders and dumps him onto a ladder set up in the corner with Cole being dropped on his tailbone. Black climbed the turnbuckle, Cole threw a chair at him, superkicked the chair and Black plunged off the turnbuckle through both tables set up on the floor and the place went crazy. Black recovered and returned to the ring, two chairs were set up back-to-back and Black dumped Cole back first on the tops of the chairs. This looked brutal. Black followed with a running knee into a chair into Cole. Kyle O’Reilly and Bobby Fish interfered and attacked Black on the floor. They cleared the announcer’s desk to put Black through it when Sanity ran down and attacked Fish and O’Reilly. Killian Dane lands a suicide dive on his teammates, Fish, and O’Reilly and everyone is down. Cole goes for Black by the announcer’s desk, Cole is knocked onto the desk and Black drives him through with a double knee stomp. They stagger into the ring, Cole has a chair and yells “I am going to end you” and goes to swing the chair and is nailed with Black Mass and Black wins. This was hands down the best match of the show so far. These two felt like the top stars of the brand and Black feels like the babyface to build the show around. A lot of violent spots in the match, some very creative ideas, the interference sets up the next tag title program and both men in the match improved their stock and could go to the main roster tomorrow. EC 3 was shown in the audience and identified under that name. A mariachi band under Lucha Libre masks plays Almas’ entrance. Ranallo mentions his background as La Sombra. Ranallo stated that Gargano’s father recently had heart bypass surgery and couldn’t be here tonight with the rest of the Gargano family. They showed Candice LeRae in the front row. The first big spot was Gargano missing a somersault dive off the apron and landing on the floor as Almas got out of the way. Almas has a choke applied and they make their way to the corner. Almas missed a double foot stomp with Gargano draped and then he suplexes Almas into the corner. Gargano connected with a slingshot spear and got a two-count on Almas. Almas lands on his feet from a top rope moonsault into a follow-up moonsault and lands the second one onto Gargano. Almas lands the double knees into the corner, he goes for another running set and misses. Almas comes back with an inverted tornado DDT for a near fall and the crowd is going wild for the match. Gargano lands a series of enzuigiris on the edge of the apron, leaps over and DDTs Almas onto the apron. Gargano lands an inside-out clothesline and lawn darts Almas into the corner turnbuckle. Almas returns with a running dropkick into the corner, Gargano counters the hammerlock DDT with an inside cradle for a huge near fall. The place is going crazy for Gargano’s near falls. Almas hits a double foot stomp to Gargano off the turnbuckle and to the floor. Almas repeatedly rams the back of Gargano’s head into the LED screen on the side of the ring. The referee isn’t sure if Gargano should continue as Almas hits the running double knees and Gargano kicks out. Gargano was selling like he had a concussion and it was very effective. Out of nowhere, Gargano hits a kick and reverse rana, huge tilt-a-whirl into the Gargano Escape as the place explodes. Zelina Vega pulls his arm, the referee tends to Vega and Gargano is raked in the eyes. Gargano lands a tope suicida but Vega stops him with a rana off the apron. Gargano is deposited back into the ring, Almas hits the hammerlock DDT and Gargano kicks out to an all-time great pop in NXT history. Vega goes after Gargano and Candice LeRae jumps the barricade and attacks her and chases Vega through the crowd. Gargano applies the Gargano Escape again and Almas gets the rope break. They went to the edge of the apron, Gargano’s head is rammed into the post and Almas hits the running double knees to send Gargano’s head into the post again. Ranallo asks if the match should be stopped to save Gargano from himself. Almas follows with the draping hammerlock DDT from the top rope and pins Gargano. This was an unbelievable main event, one of the greatest matches in NXT history and an early match-of-the-year contender. Gargano was left in the ring, Candice LeRae came to check on him as they chanted for Gargano. He left to a standing ovation. Gargano shook his head in frustration and turned to look at the entire arena. The box with the copyright notice appeared to signal the end of the show when Tommaso Ciampa showed from behind and nailed Gargano with a crutch and stood over top him while Candice tended to Gargano. Ciampa could be seen limping backstage to end the show.